Fast food costs relatively little and tastes good, but the negative effects on physical health last much longer than these immediate concerns. With the high-calorie meals come more fat, cholesterol, salt and sugar -- and therefore fewer vitamins, minerals and other nutrients -- than in healthier foods. The USDA Dietary Guidelines for Americans reports that these eating habits create nutritional deficiencies along with weight gain. The health problems that stem from overweight and obesity alone can severely limit lifestyles and shorten life spans. Fast foods contain high amounts of cholesterol and salt, two nutrients that contribute to cardiovascular health problems. The U.S. Centers for Disease Control and Prevention report a direct link between sodium intake and negative effects on blood pressure, and note that Americans consume most of their sodium in processed and restaurant foods. For instance, the USDA lists the sodium content of a biscuit, egg and sausage breakfast sandwich at 1,210 milligrams and cholesterol at 290 milligrams. That’s nearly the entire 1,500 milligrams of sodium and 300 milligrams of cholesterol the USDA recommends daily for adults. As with eating too many salty foods, getting too much cholesterol can cause plaque build-up in the arteries, or atherosclerosis. This condition can lead to stroke, heart attack and death. A healthy diet that includes more whole grains, fruits and vegetables can help you avoid the health problems associated with atherosclerosis. Many drive-through foods and drinks have high sugar content, including chocolate shakes, 62 grams of sugar, and colas, 44 grams, in 16-oz. servings as per the USDA. Fast food coleslaw, French toast sticks and even cheeseburgers contain significant amounts of sugar. Regularly consuming too much sugar can have permanent negative effects on your blood sugar levels. Diabetes requires daily medication to treat blood sugar imbalances. Serious complications include glaucoma, hearing loss, kidney disease, high blood pressure, nerve damage and stroke. To reduce your risk for diabetes, the American Heart Association (AHA) suggests ordering beverages such as water, reduced-fat milk or diet soft drinks. 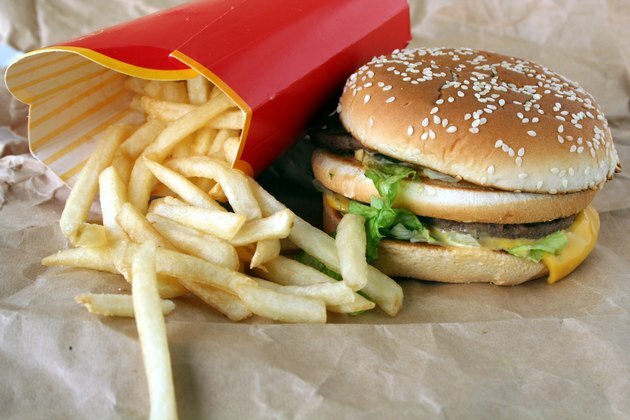 Fast foods are loaded with fat and calories. Ordering without restraint will have negative effects on your weight as you routinely take in more calories than you can expend. Hamburgers with multiple beef patties, cheese, bacon and mayonnaise may exceed the 65 milligrams fat limit recommended by the USDA for the whole day. The Office of the Surgeon General reports that obesity increases the risk for potentially fatal heart disease, diabetes and some cancers, as well as sleep apnea and asthma. Health problems such as arthritis and pregnancy complications are also more likely in obese individuals. The AHA advises maintaining a healthy weight by avoiding deep-fried and jumbo-portion dishes. How Many Calories Are in Fresh Lemon Juice?